Today when the fog lifts it's supposed to be nearly 70 degrees and sunny, and I'm ready after what seems like a week of rain! This card was made for Sketch Challenge 220 on SCS and also for last week's Ocean's 11 Challenge to make a sky on our card. Unfortunately my sky doesn't show up well in this photo, but it's sponged with pastels, using a cloud template that I purchased from Rosie's Roadshow. 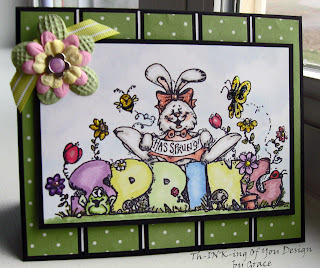 The image is from Whipper Snapper and is stamped on Georgia Pacific White with Memento Ink, then colored with Copics. I have been experimenting with my Copics. They say you need three colors in close proximity of numbers for shading, but because Copics lay down layer on layer, I have been trying to just use the same marker and go over the darker areas more times. I think it works if you can't afford to buy all the shades you need in each color family. The sketch today was great!!! I will definitely use this one again! I used SU! 's Certainly Celery DP from last year (now discontinued but replaced with a different one). I layered my strips on GPBlack, and then on GPWhite. That all got mounted on a GPB base. The image panel is popped up on dimensionals, and has stickles added, as well as a ribbon through a slot punched hole, and a layered flower in the corner. I love these springy colors.... always a sucker for pastels! Thanks for taking a peek at my card! Ocean's 11 gals... I'm late but I got the sky one done. I was going to emboss my panels and get the third one in too but decided to do a seperate one for challenge 3... hopefully today I'll have time to do another! I hope everyone has a happy spring! This is fantastic Grace! Awesome coloring job and I am SO happy it is SPRING!!! Grace, this is really amazing! I haven't seen the sketch used for inspiration for this, but I think the panel idea is so wonderful! I think your use of the copics you have is quite effective, too. I haven't gotten into the Copics (yet) but with all these great samples, it's probably only a matter of time...well done! Very Cute!! Great take on the challenge!! I am glad spring is on its way!!! What a happy energizing card! Love how it just makes you feel like Spring! What a beautiful card and a very cute image. Great coloring job too. I love my Copics and love to find ways to "stretch" them so I can work with what I have rather than buying more all the time. Wowza! Love the background and your coloring is just beautiful!! Bring on Spring! Nicely done on the sketch challenge! I like how you mixed the colored together and the flowers in the corner. That is also a really cute image.